Well, here’s the bad news: Parks and Rec has just announced that there will be a major construction delay and the park will not open until early 2015. – During the removal of the current restroom and maintenance building, excessive ground water was uncovered and had to be extracted before the contractor could continue on with the construction. – After the extraction of the excessive water, soil had to be reinforced in order to stabilize the ground. – Soil remediation work was required to be performed and completed. READ MORE. The renovations were already behind schedule and over budget. This will have an additional cost of $2.2 million. The park’s undergoing renovations are funded by the 2008 Clean and Safe Neighborhoods Parks bond, but the extra money will be coming out of the bond’s contingency reserves. This type of response from Recreation and Parks has been expected, but leaves lots of followup questions for community meetings and the public. Could we pull on it, and test it and see if it holds together? 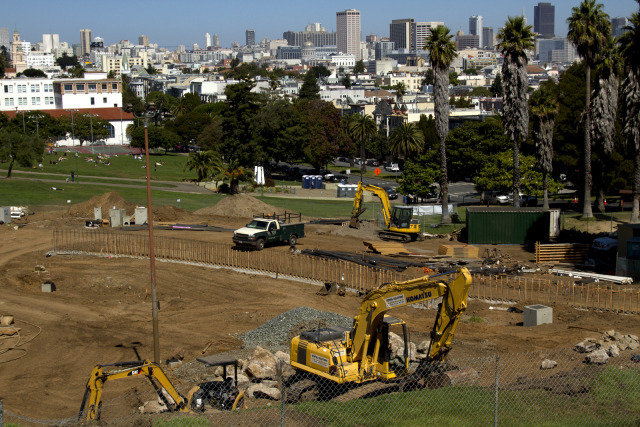 As in, did people who are visiting Dolores Park ever see them extracting excessive ground water in a way that would require a contractor to stop work? Did it happen near the current restroom? What even is the current maintenance building, I remember a metal trailer and no Maintenance building, or do they mean the same building as the bathroom? Why the amount of excessive water something that was not to be *”expected”*? How much water in gallons were they talking about? Would that really cost 2.2 million dollars? Is the “unforeseen” event enough to raise the contract price and stop work? Really, a lot of question still need to be answered before this announcement is a satisfactory way to inform the public. How can ground water at Dolores Park be “unexpected.” There is an underground creek running downhill under 18th Street and into the park, which is mentioned in histories and environmental impact reports. Additionally, for years, the park has had drainage issues. The grass feels like a giant sponge in many spots, even on hot days. This “excessive” underground water should have been anticipated and planned for. Right, Missionlocal knew about the water underground and previously wrote about it. and the water was obvious to many picnickers who sat on certain portions of the park and got up with their pants damp. So how does it happen that the City could have signed a contract that allows because because neither the City nor the construction company knew what everyone else knew, and “expected” the water the taxpayers pay an extra $2.2 Million dollars. Frankly, it is difficult to trace the variable flow of groundwater under Dolores Park (which depends on how much it has been raining) without digging the place up first. Nearly two years ago, I wrote several letters to Rec & Park informing them that there is a live spring on the North-West side of Dolores Park; and I provided a historical aerial photograph showing evidence of the spring circa 1947. Even without multiple written notices from me, Rec & Park senior staff were aware that there is a lot of ground water all over Dolores Park long before they started construction. a four month delay is no big deal on a project that size. They will get it done eventually.